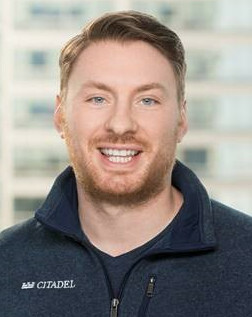 Michael Watson, is a Data Architect and Engineering Manager at Citadel working with the Fundamental Equities businesses (Global Equities, Surveyor Capital, Aptigon Capital and Ashler Capital). Over his years at Citadel, Michael has architected and engineered multiple systems to improve the research process for portfolio risk and performance analysis and alpha generation. Michael is a charismatic, process-focused technology leader who understands the demands and necessary tools of the world's best multi-strategy hedge funds. Michael credits much of his success to his multi-disciplinary BS economics degree that coupled advanced math, computer science, and applied econometrics. He is a strong proponent of integrating fundamental computer science skills more closely into the undergraduate economics program. He is also a member of the Associate Board for University of Chicago Cancer Research Foundation, a mentor for iMentor Chicago, and an organizing member of Chicago's Econ Alumni Mixer series. His is a sailor, snowboarder, and mountain climbing enthusiast.